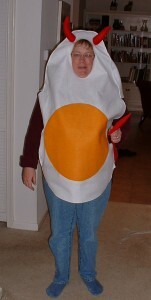 Why, of course I have a deviled egg costume! And here’s a devilish spicy treat from my cookbook “Deviled Eggs: 50 Recipes from Simple to Sassy” (Harvard Common Press, 2004) to go with it. I haven’t yet found a milk bottle costume for my new book, “Buttermilk: A Savor the South Cookbook” (UNC Press). Combine the thoroughly mashed yolks with the mayonnaise and mustard. Stir in the hot sauce, curry powder and garlic powder. Taste, then season with salt and pepper (you may not need any). Fill the whites evenly with the mixture. If you really like it hot, garnish each egg half with a dab more hot sauce. Smoked paprika makes a good garnish, too. Makes 12. Great quotes rose like blue smoke during the Southern Foodways Alliance 15th annual symposium recently, which focused on barbecue in all it’s glory. I thought I’d randomly share some of what I gleaned from my notes, but to hear the full real things – including novelist Monique Truong’s lovely tribute to Red Bridges Barbecue Lodge in Shelby, N.C. and North Carolina writer Randall Kenan’s great essay – visit here for podcasts. “Consumers are stupid.” – Comment during Q&A after the panel. “Consumers aren’t stupid, they’re struggling.” – Me, when the previous statement ticked me off. “Pigs domesticated themselves. If you need meat in a hurry, pig is for you…Pigs can’t be driven and could be fed on garbage. It gave (poor people) meat outside the economy. Pigs gave them freedom.” – Mark Essig, author of the forthcoming “Pig: A Nose-to-Tail History of Civilization,” in a talk on the history of the pig. He also pointed out that we now have fewer farms but many more pigs. “I AM the pitmaster!” – Helen Turner, proprietor of Helen’s BBQ in Brownsville, Tenn., in an oral history film about her. She received the Ruth Fertel Keeper of the Flame Award. Folks are often surprised to see a woman at the helm of the pit. “I’m going to have to get me a second Spanx,” – comment reportedly heard on the bus after Raleigh chef Ashley Christensen’s luscious all-vegetable lunch. How many ways can you devil an egg or compose a quiche? Those two types of egg-related foods were abundant in the cooking contest I helped judge at the N.C. State Fair in Raleigh. I guess they were obvious choices – the theme was The Incredible Edible Egg Appetizer/Picnic Recipe Contest, sponsored by the N.C. Egg Association. Each entry had to use at least four eggs in the recipe. The five other judges and I tasted 16 entries. 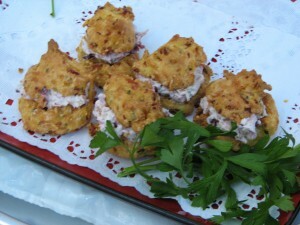 What set the winning three apart, for us, was creativity but staying within the idea of a dish for an appetizer or picnic (some entries stretched that concept quite a bit); balanced flavors and quality ingredients. The winners were: first place, Gail Fuller of Raleigh for her Bacon-Cheese Puffs, rich little cheesy biscuits with a contrasting filling; second place, Silke Bourgeois of Durham for a layered dip-like dish using feta cheese, chickpeas, tomatoes and eggs; and third place, Amanda Boury of Raleigh for Fall Harvest Mini-Quiches, a refreshingly different quiche using roasted root vegetables. I was told that the recipes would be up on the fair website, but I haven’t seen them yet. The fair is one place that anyone can enter their favorite food and win something. I enjoy looking at the pickles, jams and jellies competition – and there seemed to be more entries in those this year, particularly from men. While I was looking at the winning jar in the dried corn category and wondering what you’d use it for, Jean and Walter Davis of Youngsville showed up to check on Jean’s entries. She won blue ribbons for her squash pickles and what she called everyday cucumber pickles. “I used to think my mother called them everyday because you could eat them every day,” she said. “But when I started making them, I realized it was because you had to pick the cucumbers every day to get them small enough.” The perfect little cukes are no longer than a finger. Walter proudly told me that Jean used to can 600 jars of pickles, jams and jellies a year. He was in sales, and sent his wife’s homemade delicacies to his customers for the holidays. Her jams were a big hit in Japan. The couple used pecans in the shell as packing peanuts. “People in Colorado I sent them to said they had never had pecans, and that the packing material was as good to eat as what was in the box,” Walter said. Both are retired now. Jean still cans, just not as much. “But we still get calls from his old customers, seeing if they can still get something,” she says. To keep up with things as a food writer, I’m always looking for the new and trying out different recipes. I just plain like to explore, too. But that makes it very easy to forget those old-friend recipes. This is a versatile curry sauce from the book that includes curry leaves, which are easier to find now than when I received the book in 2001. But they’re always at Indian markets, and the flavor they add is worth the trip. I pick up some frozen naan bread and a couple of jars of chutney or pickles to go with the curry, and it’s dinner. You can add fish or chicken, but I like a vegetarian version. Here’s my slightly modified version of Oliver’s My Favourite (note the spelling) curry sauce. About 2 pounds chopped vegetables of your choice. I like to use peeled sweet potatoes and sliced green bell peppers, but you could use zucchini, beans, lentils, spinach or cauliflower. Although I discovered this time that cauliflower did not mix well with my aging tummy. So just beware. Heat the oil over medium heat in a large, deep frying pan. Add the mustard seeds and stir and fry them until they begin to pop. Add the fenugreek seeds, chilies, curry leaves and ginger. Stir anf fry for a few minutes. Add the onions and cook for a few minutes until they begin to soften. Add the turmeric and tomatoes, plus 1 can of water. Add all the vegetables and stir to combine. Add the coconut milk and stir. Bring the whole thing to a simmer, cover and let simmer for 20 to 30 minutes, or until the vegetables are soft but not mushy. Taste and add salt as needed. Serve with cooked rice.